The US market for lubricant additives is impacted by a number of factors, but is primarily dependent on demand for finished lubricants. Additives are used in most types of industrial lubricants (e.g., industrial engine oils, metalworking fluids, and hydraulic fluids) and substantially in all factory- and service-fill automotive applications (e.g., motor oils and transmission fluids). Consumption of lubricants is in turn related to the overall state of the US economy, as lubricant use in the short term is closely tied to manufacturing activity and motor vehicle usage. 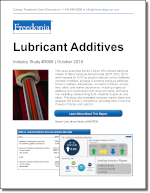 In addition to US economic activity, environmental and regulatory factors are also significant in driving demand for particular types of lubricant additives and in promoting technological developments that may impact the types and quantities of additives used. The long-term trends toward demand for higher fuel efficiency and reduced emissions have significantly impacted automotive lubricant additive markets, while issues relating to worker health, waste handling, and other environmental concerns have most impacted the market for industrial lubricant additives. The development of new technology is significant to the lubricant additives industry in terms of both the types of additives that can be produced and the demands placed on lubricants used in automotive and industrial machinery. Due to advances in manufacturing, automotive, and lubrication technology, many types of machines now operate at higher speeds, temperatures, and pressures than in the past, with smaller oil sumps and longer drain intervals. These conditions require higher-performance lubricants, and both the quality and quantity of additives used are important considerations in achieving these requirements.